The reason for this website is to help you, if you need cosmetic dental work, avoid getting into trouble by thinking that your regular family dentist can do a smile makeover. I have amassed a large collection of stories. Some of them are listed and explained on my cosmetic dentistry horror stories page. Most of them are catalogued in my blog, which you can find linked under Miscellaneous in the menu. Here I thought it would be helpful to reprint this carefully researched and thoughtfully written article from the Wall Street Journal, so that you know it isn’t just me and my private opinion, but this is a real problem. The latest trend in cosmetic dentistry isn’t a new kind of tooth-bleaching product: It is fixing other dentists’ mistakes. Americans’ desire to have the perfect smile—spurred by reality “extreme makeover” shows that follow an individual’s physical transformation through a variety of cosmetic surgeries are resulting in a wave of dental catastrophes, say dentists who repair the botched work. Since the American Dental Association doesn’t recognize “cosmetic dentistry” as a specialty, dental school graduates are automatically licensed to perform cosmetic procedures. Additional training isn’t mandatory the way it is for other specialties such as orthodontics. Comment by mynewsmile.com: You, the consumer, are made vulnerable by this lack of definition. So this website screens dentists and lists those who are excellent cosmetic dentists. Unfortunately, since the extra education isn’t mandatory, very few dentists dedicate themselves to obtaining it. It’s expensive and inconvenient, and if you can claim to do cosmetic dentistry without taking the extra courses, why go through the trouble? A 54-year-old woman, unhappy with her initial dental work (top), got a new overhaul (bottom). Comment: I wouldn’t be surprised if the dentist who did the case and produced the result labeled “before” was happy with the work. The prevailing opinion of most of my dental school professors would have been that this work was fine, and that if the patient wasn’t happy with it, she was being too fussy. This is at the root of the level of quality of cosmetic dentistry in the country. The mindset of the dentist is that of an engineer who is concerned with strength and function, and cosmetic concerns are considered trivial. Cosmetic dentistry is difficult to define because many of the procedures blur the line between the purely aesthetic and the practical. Comment: A little explanation would have helped the article here. Here’s what they mean: A broken front tooth needs to be repaired. So a dentist does a crown on this front tooth. That is general dentistry. But doing that crown in such a way that it perfectly matches the adjacent teeth and looks beautiful, that is cosmetic dentistry. It’s a line that is difficult to precisely define. 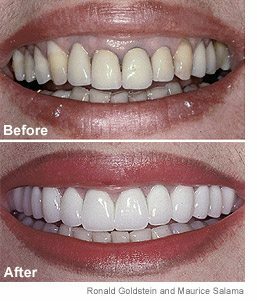 Procedures that are considered cosmetic range from bleaching to attaching porcelain covers to the front of teeth. Yet some patients without dental problems are opting for crowns—in which a dentist grinds down an existing tooth to attach a cap—to cosmetically change a bite (which usually is corrected with braces when it is an orthodontia problem). Cosmetic procedures, which typically are performed to improve the color and shape of teeth, are risky and can cause permanent damage to teeth, roots and gums if done incorrectly. If a crown isn’t cemented properly, for instance, infections can result. Ronald E. Goldstein, an author of cosmetic dentistry textbooks and founder of the American Academy of Esthetic Dentistry—which isn’t affiliated with the ADA—estimates that half of the $70.3 billion spent annually on dental work in the U.S. is related to cosmetic procedures. Of that, the Atlanta dentist says, redoing other dentists’ shoddy work and misdiagnoses accounts for $10 billion of that. Several other academic dentists back the estimates. Click here to read about the difference between a general dentist and a cosmetic dentist. Click here to read some of the many letters I have received from disappointed patients over the years. “For the patients, it’s a problem—how do you determine who the best cosmetic dentist is?” says California Cosmetic Dentist Larry Addleson, president of the American Academy of Cosmetic Dentistry (AACD) (also a recommended mynewsmile dentist from San Diego). He says 15% to 20% of the patients in his San Diego practice are victims of poor work. Eric L. Fugier says that at least half the clientele at his Hollywood, Calif., practice come with botched jobs he fixes. For Robert Vogel, a Manhattan dentist who works on celebrities such as Madonna and Nicole Kidman, it is upward of one-fourth. Comment by mynewsmile.com: These numbers are typical for dentists in our referral network—it isn’t uncommon for us to hear a figure of 40% of their business comes from re-doing dental work by other dentists who were trying to do cosmetic dentistry. To illustrate this, we asked one of our listed cosmetic dentist to send us a sampling of photographs of some of his re-do’s of previous dentists’ attempts at cosmetic dentistry. Please see our page of photographs of cosmetic dentistry re-do’s. Some dentists who sweep up after their colleagues’ poor work blame inexperience or the temptation to lure patients into costly procedures. Others say that as more cosmetic procedures are performed, the number of mistakes rises. Comment: In my experience, most of the re-do’s come from genuinely ethical dentists. The patient, not understanding the degree of artistry required to do a procedure, asks a dentist to do a smile makeover. The dentist, not being artistic and not having sensitivity to appearance-related issues, tries and thinks the work looks just fine, and can’t understand why the patient doesn’t love it. Experts say that even though further training isn’t mandatory, practitioners should take it upon themselves to boost their education. “To do an entire mouth restoration and crowns is usually out of the scope of recent graduates without more continuing education,” says Dennis Tarnow, professor and chairman of implant dentistry at New York University’s College of Dentistry. For-profit companies offering “continuing medical education” charge dentists as much as $10,000 a course, and business is booming. The Las Vegas Institute for Advanced Dental Studies, for instance, is teaching 600 dentists this year, compared with just 200 four years ago. LVI also offers courses in financial strategies, such as “The Dental Concierge—Developing a CA$H Practice,” according to its Web site. Some dentists are critical of LVI’s commercial bent. “They give the wrong message to the dentist that it’s OK to grind down teeth and sell the patient that their life is going to change and improve,” says Simon Gamer, a dentist in Beverly Hills, Calif. LVI founder and Chief Executive Bill Dickerson disagrees, saying the school trains dentists to be professional and to handle “any situation that comes to the office. We tell them to diagnose the patient’s mouth as if it were your own. “Makers of cosmetic-dental products and laboratories supplying goods to cosmetic dentists say their businesses are expanding at double-digit rates. Da Vinci Studios Inc., a California dental lab that makes customized veneers and crowns for 1,500 dental practices—and whose veneers are featured on the “Extreme Makeover” and “Swan” reality shows—says sales rose 25% last year. MicroDental Laboratories Inc., a Dublin, Calif., lab, had $23 million in revenue from porcelain veneers last year, up from $12 million in 2000. Patients are paying thousands for a million-dollar smile. Veneers and crowns can range to as much as $4,000 a tooth, and in-office whitening can cost as much as $1,000. That compares with $50 to $250 a tooth for conventional procedures such as cavity fillings. Comment: Typical fees as of the date of this article are between $1000 and $2000 per tooth. As a result, dentists’ incomes are soaring. Their average annual income was $173,140 in 2001, the most recent year for which figures are available from the ADA, up from $133,430 in 1997. Larry Winans, a 39-year-old Lewisburg, Pa., dentist who took courses at LVI, says he went from earning about $100,000 in 1999 to more than $200,000 today, mostly because of increased business in cosmetic work. William Dorfman, a Century City, Calif., dentist who is featured on “Extreme Makeover” and who sees 200 new patients each month, says their “dental IQs have skyrocketed” since the show began because now they are aware of the kinds of cosmetic dentistry available. “In the old days, it took a lot of time to explain the procedures,” Dr. Dorfman says. Now, “it’s almost like all I have to do is verify what they want done.” Gordon J. Christensen, a clinical professor at the University of Utah and owner of the for-profit, continuing-education Practical Clinical Courses in Provo, Utah, commented on the rise in incidence of botched work. He says the onus to halt the rise of botched work falls on the ADA, which can recommend additional guidelines for cosmetic dentistry to state and local dental associations. However, the ADA, which represents the vast majority of the more than 155,000 U.S. dentists and advises the dental boards of each state, believes current ADA guidelines and state regulations provide “sufficient oversight for the protection of the public,” says Matt Messina, an ADA consumer adviser and a dentist in Cleveland, Ohio. Comment: This response from the American Dental Association is an indication of how the majority of dentists, because of their lack of appreciation of appearance-related issues, trivialize the problem of ugly cosmetic dentistry. To them, it matters only that the dentistry is functional and that it meets a very minimum standard of appearance. This is what the ADA guidelines are—a standard of functional care. In their eyes, the complaints of many patients that their cosmetic dentistry doesn’t look good enough—those complaints are trivial. Dentists say it also is up to patients to check their dentists’ credentials and complaint records with their state dental board and county dental association, ask about more conservative treatments, and get second and third opinions before major work. Click here to read Dr. Hall’s blog post about how to ask for a refund from your dentist. Comment by mynewsmile.com: This article validates my own experience in practicing cosmetic dentistry for some twenty years. People have a family dentist that they trust, and the family dentist thinks that he or she can do cosmetic dentistry, when the truth is that doing cosmetic dentistry well requires much specialized study. Thus, his or her attempts often need to be re-done by a true cosmetic dentist. The first dentist is probably well-intentioned and also is probably reluctant to refer the patient to an expert cosmetic dentist for fear of permanently losing that patient. The assurance from the ADA that it and state boards provide “sufficient oversight for the protection of the public” is reassuring only in their eyes. Too many of the “powers that be” in dentistry feel that appearance-related dentistry is frivolous, and as long as the work is functional, it’s fine. Thus a situation that might be extremely disappointing in the eyes of a patient as far as the appearance of their dental work may be no problem at all in the eyes of many of these traditional dentists who are trained only for functional treatment.